Who We Are | Indy Pride, Inc.
Indy Pride, Inc. produces events which educate, honor our history, and celebrate the diversity of the Indianapolis Lesbian, Gay, Bisexual, Transgender, and Queer community. We exist to unite and serve our members and the LGBTQ+ community of Central Indiana through leadership development, educational programs, and community events which achieve inclusivity, equality, strong community connections, and awareness of LGBTQ+ issues. Best known for the annual Indy Pride Festival, Indy Pride, Inc. also does philanthropic work throughout the year to support many other LGBTQ+ support organizations throughout Central Indiana. In addition to the Indy Pride Festival and events during Pride Month (June), we host a Community Thanksgiving Dinner, award scholarships, facilitate educational events, collaborate with LGBTQ+ organizations, and work in partnership with Circle City Pride Softball, LGBT Film Fest, and Pride Volleyball. 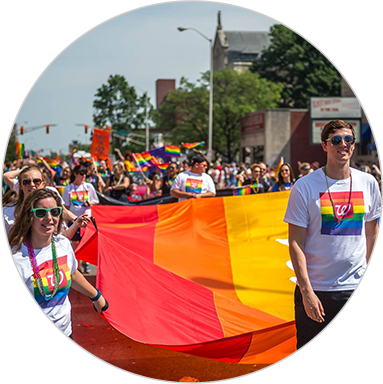 Indy Pride, Inc. is led by an all-volunteer Board of Directors, who act as a working board, filling executive positions to take care of most working functions of the organization. We have recently grown large enough to hire an Executive Director to create more efficiencies and consistency within programs, operations, administration and management from year to year.